The online and land-based versions of the baccarat involve a banker and a player. In live baccarat, table action is handled by a live dealer who also interacts with online players via a chat feature. They greet the player when starting the session and respond to their concerns throughout the game. Playing live baccarat means that the player competes against a real dealer, not against a computer software as in the case of online baccarat. This brings the real-life baccarat experience right at the player’s fingertips as they watch the dealer do their things and get social on the computer or handheld device in real time. The rules of baccarat are reasonably straightforward. Players choose one of three bets. One can place the bets either for the banker or player with the closest to nine points– cards 2-9 have their face value, an ace is worth 1, while a 10 is worth 0 points. The hand total can never exceed 10 points. When the total exceeds 10, as in the case of a hand containing a 6 and a 5, the left-hand digit or the tens digit is removed. The third card rule applies when the player or banker can draw a third card. The player always goes first. Given the baccarat’s binary nature, it is reasonably easy to win. A basic strategy is to bet on the banker. Why? The banker typically offers a marginally lower house edge compared to that of the player– 1.06 to 1.24 affixed to the banker and player respectively. The 1-3-2-6 strategy is often used to place small bets with an eye on decent winnings. In this strategy, the maximum amount the player can lose is $2 if one loses the first two bets. Players need to have good grasp of this betting strategy and possibly test it before its real application to beat they house. Baccarat is understood to have been created by an Italian gambler by the name Felix Falguerein. This game was first played using tarot cards, which were later replaced with the 52-card deck. It was shared to France where it was widely accepted and later to other parts of Europe and America. The history of the baccarat isn’t finished just yet, and the game is always being developed, which is good news to all its fans. With the existence of the internet, the 21st-century players prefer playing the online version of this game. The advent of live dealer baccarat games has since taken the game to new heights. The legality of gambling in South Africa has been in doubt for a long time. Fortunately, South African gambling aficionados now have an opportunity to play baccarat. Besides playing the game in land-based casinos, players can now enjoy baccarat online, giving them an opportunity to win real money at their convenience. As far as online baccarat is concerned, South African players stand to take their gaming experiences a notch higher thanks to live dealer games. As such, online gaming levels all types of gamblers as it is reasonably easy to play. Most online casinos make it this easy to encourage gamblers to play. All you need to know about online baccarat! WHY IS BACCARAT SO POPULAR IN CHINA? In the 1930s when gambling establishments were opened in Macau, Baccarat was one of the first games to be introduced to the casinos. Since its introduction, it has been popular among Chinese players because it gives players a winning edge over most of the other casino games. The winners are also declared by how much their combination is close to 8, a number which the Chinese consider lucky. SHOULD YOU ALWAYS BET ON THE 'BANKER'? That will depend on your intuition. But if you like statistics, you may risk it because the proven odds for a Banker bet to win each round is 45.85% compared to the Player’s 44.62%. In the long term, you may consider placing more bets on the Banker because of the favorable odds. DOES CARD COUNTING WORK IN LIVE BACCARAT? Sure! Just as in blackjack, the act of reading the number of cards played and using the information to estimate the number of remaining cards can be useful in predicting the result of a round. This is especially in your favor since certain cards mean a lot in baccarat. WHAT ARE THE BEST BETS IN LIVE DEALER BACCARAT? For the live baccarat, the Banker bet is recommended because of the house edge difference. In an 8-deck game for instance, if there is no tie, the house edge is 1.06% on the banker bets while the Player bets are 1.24% and 14.36% on Tie bets. WHAT IS THE BACCARAT COMMISSION? The baccarat commission charge of 5% (in most casinos) is usually applicable to banker bets while players are charged no-commission on winning. Even with the commission charged on Banker bets, it is still preferred to Player bets because the expected return is more than all other bets in baccarat, even after the commission has been deducted. HOW MANY DECKS ARE USED IN AN ONLINE LIVE BACCARAT GAME? Live baccarat games are usually played with either 6 or 8 decks of cards with values different from other casino card games. For example, the King, Queen, Jack and 10 are valued at zero while the ace is valued at 1 and the rest of the numbers are valued at their face worth. HOW DO I BET AT A LIVE BACCARAT TABLE? Betting in baccarat is very simple, even for beginners. The chip is expected to be placed in the designated area of choice depending on the bet type which could be main bets (Banker, Player, & Tie) or side bets like Banker & Player pairs, Perfect pairs or Dragon 7. WHAT'S THE MINIMUM BET AT A LIVE BACCARAT TABLE? The minimum bet at a live baccarat table is determined by the type of table. Live baccarat tables’ minimum bets are usually $1. But the minimum bet on VIP tables can be increased from the $1 to $5 or even $10. When compared with actual baccarat casino, the live baccarat minimum bet is lower. WHAT ARE THE ADVANTAGES OF PLAYING BACCARAT ONLINE? • Lesser Pressure: Betting areas take center stage on the screen when played online. This reduces the pressure of placing bets. • Convenience: Bets can be placed anywhere, even in the bathroom. • 24/7 availability: Online casinos offer lots of games and players will always find a table of their choice. • More Games: Online casino platforms offer more games. • Bonuses: Many online casinos offer bonuses especially for first-time users. • Player-Friendly: The minimum baccarat bet in an online casino is usually lower compared to actual casinos. • Perfect for all levels: Players can choose the best and most convenient table to play, especially based on their level of expertise. HOW CAN I PLAY BACCARAT ONLINE? Before you are allowed to play, most baccarat operators will require a deposit of about £10 which may qualify you for a sign-up bonus depending on their policy. After the deposit, you can start playing. However, with the first withdrawal of your winnings, the casino may request for either your email, photo ID, proof of address, or preferred mode of payment. HOW DO I WIN AT LIVE BACCARAT? The person who wins a round at Baccarat is the one who correctly predicts the hand that will have the closest number to 9. You can also win by predicting that both hands will result in a tie. Considering the house edge, the Banker has the lowest (1.06%) rate compared to the other wagers that are placed. The player has 1.24% and the tie gets 14.36%. Betting on the Banker may yield more returns. IS PLAYING LIVE BACCARAT SAFE? The answer is YES and NO, and this depends on the online platform that you play. When live baccarat is played on a certified operator’s platform, it is safe. It is also advisable not to play beyond what you can afford. Luck plays a huge part in baccarat just as in any other gambling game. WHAT'S THE DIFFERENCE BETWEEN LIVE BACCARAT AND BACCARAT PLAYED IN AN ACTUAL CASINO? The Baccarat game policy for both live and actual casino games are the same. The only difference is the mode of play. 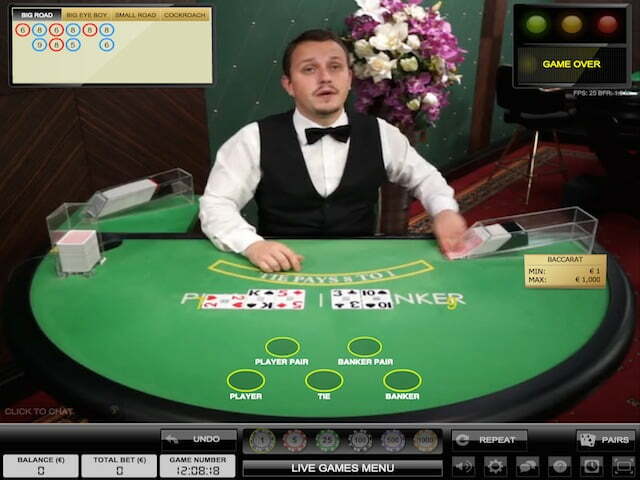 The live baccarat can be played anywhere and anytime, provided there is an internet connection. Plus, many operators offer many incentives on their online platforms and also allows for minimum bets that are player-friendly. WHAT’S THE DIFFERENCE BETWEEN LIVE BACCARAT AND RNG BACCARAT? Live baccarat requires a real studio, table, cards, and cameras to monitor the game with a physical dealer. The game is also recorded live. However, in RNG baccarat, all of these features are virtual or computer generated. HOW DO I PLAY LIVE BACCARAT? Baccarat game today is a derivative of Punto banco. Chips are placed on the highlighted places for one of the possible outcomes (player, banker, and tie) and other side bets. The basic needs are a stable internet connection and a gadget to access your online casino platform of choice.